I posted the original story that went along with the photo a few months ago. So this is more an update. The French appear to be somewhat stricter or at least that’s the impression. Parents to jail, then deported and banned from returning. Of course, Romas being who and what they are, it’s a sure bet they will try to return. From their standpoint, I would imagine they’ll try for Britain where they will invoke human and civil rights and the right to a family life with compliments of the over abused Brit taxpayer. As for the kiddies. Well, as you’ll read here, cos they are after all at so tender an age, the police simply let them go. Sure thing. So the little shits can continue doing what their culture instills in them. I still don’t understand, I really don’t, why it would be so awful to give the police the authority to simply delete the scum. The kids as well. Not only would it greatly reduce the burden on the French and clean up their cities, it would work to the benefit of Europa overall. But no. It’s a ring fenced loop that plays on and on. Seems to be the unspoken motto of this group of sub human life forms. Twenty Roma parents and other family members who sent their own children on to the streets of Paris to rob holidaymakers were beginning prison sentences of up to eight years each yesterday. British visitors were among the hundreds of tourists targeted each day around the Louvre, Notre Dame and the Eiffel Tower by some 40 youngsters. There were disturbances in the court late on Friday afternoon when the tough sentences were handed down. The heaviest went to women – including mothers – involved in the crime network. He said those imprisoned were ‘involved in industrial-scale exploitation of their own children’. Comparing them to modern-day Fagins, he said that children who failed in their targets were often beaten. The offences took place between 2011 and 2012, and the youngsters involved were aged between nine and 17. Two women and one man were sentenced to eight years, while a woman and a man got seven years each. All were permanently banned from France. One of a series of photos showing roma kids at work. 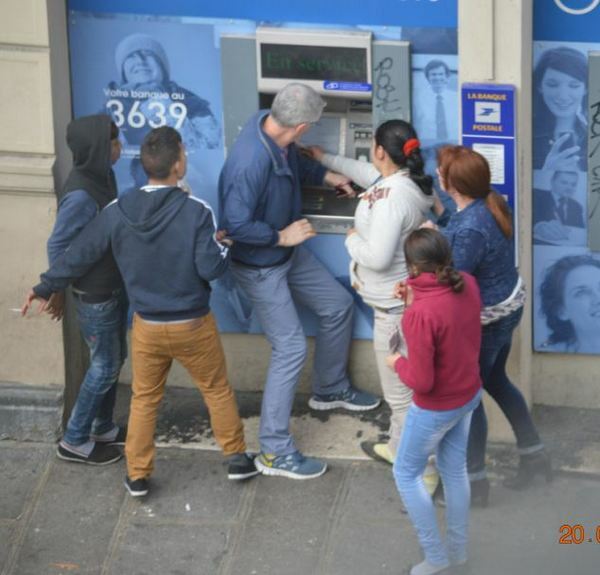 Recently in our neck of the woods, a group of roma adults did what you see here, inside the bank itself, to a woman at the atm machine. They are bold because generally, they are allowed to be.